What this country needs right now is a racist president. Fortunately, we have one running. His name is Donald Trump. “Thousands of people over the years have worked for me from all the different the Latin countries,” he recently told reporters. Apparently not all the Hispanics who worked with him, and for him, feel he would make a good president. Last week, Univision, which also airs the Miss USA and Miss Universe pageants, announced it would end its relationship with Trump over his “insulting” remarks. Yes, the Donald started off his bid for the presidency by calling Mexican immigrants criminals and rapists and suggested they were pouring over the border non-stop. 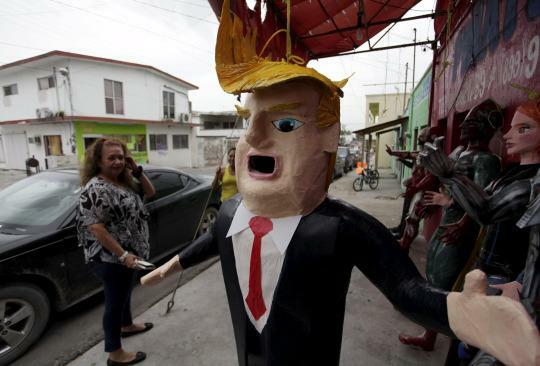 You can bet that will galvanize Hispanic voters to vote for him – wink! wink! NBC announced it was cutting ties with Trump over his racists comments in which he vowed to build a wall between Mexico and the United States to keep Mexican criminals and “rapists” from crossing the border if he were elected president. While the rest of the campaigning Republicans are looking for ways to connect with Hispanic voters, the Donald is busy accusing them of being scum. Pretty crazy strategy eh? Here’s the scary part…according to the results of a CNN/ORC survey released Wednesday, Trump, at 12 percent, sits second behind former Florida Gov. Jeb Bush (19 percent) in the race for the Republican nomination. The Donald managed to jump 9 points in the polls after making his racist announcement! What does that say? I’m no pollster, but it looks like some people would like to have a racist president. Like I said earlier…fortunately – for some – the Donald looks like presidential material.